A new £60m GPS tagging system for offenders is five years behind schedule and has so far delivered no benefits, a report has said. The Ministry of Justice had said the new technology would save money and be in place in England and Wales by 2013. But a National Audit Office report says the plan was too ambitious and lacked evidence it would work. The MoJ said it was now in a "strong position to continue improving confidence in the new service". The government has used electronic tagging services as part of the sentencing and supervision of offenders since 1999. The technology is used by police, courts or probation services to track the location of offenders and make sure they comply with home curfews. In 2011, the MoJ launched a programme to develop a new "world-leading" ankle tag that combined radio frequency and GPS - or satellite - technology. It set out to procure the service using a new "tower" delivery model, which incorporated contracts with four separate suppliers who would provide four different elements of the service. But the NAO, an independent spending watchdog, found the MoJ set an "unrealistic" timetable for the plans and adopted a "high-risk" procurement strategy. 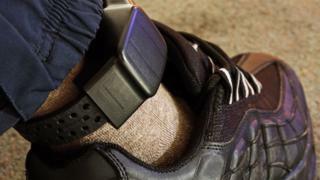 The MoJ is "only now" running location monitoring pilots to test how the use of a GPS tag might affect the behaviour of offenders, the report noted. "The ministry assumed there would be high demand for location monitoring from those who sentence offenders, but did not run a pilot to test this before launching the programme," the review said. "It also did not understand the potential financial costs and benefits of expanding location monitoring." Liberal Democrat home affairs spokesman Sir Ed Davey said the system had been a "disgraceful waste of public money". He added: "It has been bungle after bungle and now we learn that very little will change after all." An MoJ spokeswoman said there were "challenges" in the delivery of the programme between 2010 and 2015. "We are now in a strong position to continue improving confidence in the new service and providing better value for money for the taxpayer."